Jutting out the slate and bone dry earth, the Aloe dichotoma, or quiver tree, is a spectacular and resilient desert aloe. Indigenous to Southern Africa, this succulent derives its name from the San*, who used to hollow out the branches to make quivers for their arrows. Quiver trees hold a sense of majesty. Their large stocky stem is a plinth for their beautifully sculpted branches, penetrating the horizon. Reaching up to nine meters, it is a sight that cannot be missed. A desert of rock and dust and giants. Its high stature and elevated branches allow it to escape the radiating heat that rolls off the desert’s surface. Their branches are coated with a heat reflective white powder and their internal adaptive CAM metabolism, a form of extremely efficient photosynthesis, allows them to salvage and save what little water they can. They retain water and as such provide a crucial source of moisture for their arid ecosphere. The quiver tree survives where nothing else can, in the most barren of landscapes, and against all odds. But these odds have shifted with the climate. With lifespans of up to 350 years, these trees have witnessed an aging world change. And they have adapted accordingly. Over the centuries, the migration of the quiver tree can be traced south, as they flee from the rising global temperatures, which are most evident near the equator. They are retreating to higher latitudes and higher altitudes to escape a heat even they cannot withstand. 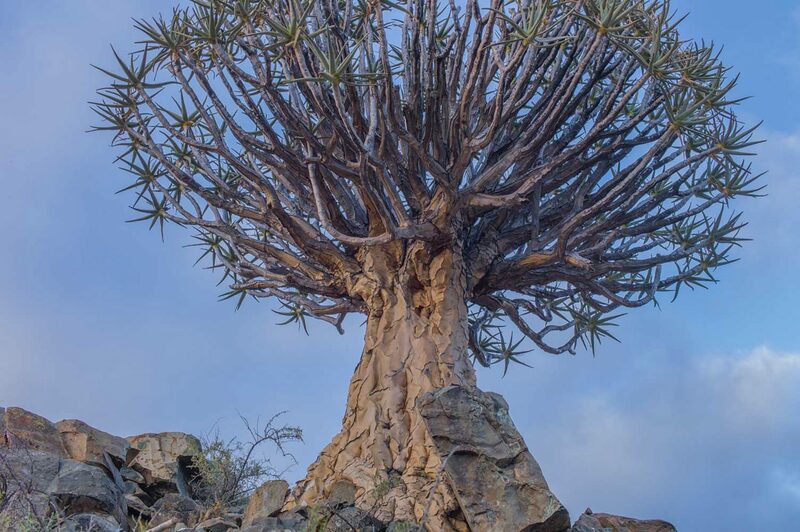 A wild plant renowned for its drought tolerance and longevity, the quiver tree migration is a irrefutable reminder of the very real, very visual signs of the effects of climate change. As a result of reaching their heat tolerance, the quiver tree is now critically endangered. Their long life span and slow growth and maturation in turn contribute to limited pollination. Scientists are now addressing the question of assisted colonization (by planting their seeds further south for increased chances of survival) to face the increasingly prevalent challenges of our changing climate.